***NOTE: This article is an editorial/commentary issued by the network and/or company named below. Any errors, typos, etc. are attributed to the original author. The article is reproduced solely for the dissemination of the enclosed information and may not necessarily be the opinion of A Liberal’s Libretto. We wish nothing but the best for City Opera. April 22 (Bloomberg) -- In classic media playbook style, the New York City Opera selectively released more bad news on a Friday afternoon, hoping nobody would notice that it had once again reached deep into its endowment. That money, left by Lila Acheson and DeWitt Wallace, the founders of Reader’s Digest, is sure going fast. In 2001, according to a petition filed with the New York State Supreme Court, it was $51 million. Until the company spent $17.5 million in October 2008, it stood at $27 million. Now, with another whopping $6.6 million used for operating expenses, the endowment is down to barely $3 million. Lest you think the company’s disastrous financial situation reflects a melting economy, the damage has been largely self- inflicted. A clueless board led by Susan Baker has squandered the company’s endowment and ruined its good name. To top it off, a strike is possible. The orchestra, whose contract runs out at the end of May, is being asked for significant concessions. The other unions involved in putting a show on stage have been asked to re-visit their contracts early, according to Alan Gordon, executive director of the American Guild of Musical Artists. Remember her? It was here at City Opera that the diva built the glittering career that turned her into a media celebrity. Named general director in 1979, Sills ran the company for a decade, raising vast sums of money in often shaky times and keeping its profile high. If only some of her genes had been titrated for posterity. NYCO lurched toward the abyss over two years ago when Baker and her executive committee failed to have a general manager ready to replace Paul Kellogg, who retired with plenty of notice. Months later, Baker’s board hired Belgian big Gerard Mortier, who, however, already had a job running the Paris Opera for another two years. Crazy doesn’t begin to describe his appointment. Here’s a guy known as a big spender of public subsidies who hates traditional operas. Puccini makes him sick. NYCO began dying right about then. Mortier, of course, ended up thumbing his nose at his future employers by applying to run the Bayreuth Festival while officially the chief-to-be at NYCO. Then he signed up for Madrid’s opera. Nicer building, warm climate, more money. While we still don’t know how much this farce cost the company in terms of canceled contracts and oceanic shuttling, the sinking endowment along with the shrunken staff suggest the company is heading for life support. Inexplicably, Mortier talked the board into dropping the 2008-09 season, supposedly because the New York State Theater at Lincoln Center is being renovated and renamed the David H. Koch Theater. In petitioning the court to dip into the endowment earlier this month, the company claimed repeatedly that it was deprived of performance income because the theater was closed. Yet the New York City Ballet, which shares the theater, managed to perform without any major disruptions. Meanwhile, the company was obligated to pay its orchestra and other unions. A lot of poor staffers who enjoyed no union protection ended up in the cold. Mortier’s replacement inspires little confidence. George Steel ran the intimate Miller Theater at Columbia University, where he had a mixed reputation on campus, but the support of Mary Sharp Cronson, a prominent City Opera board member, plus some critics and a small audience attracted to edgy repertoire. After a few months running the Dallas Opera, which moves into a dazzling new arts complex this fall, Steel bailed out for NYCO, leaving, it seems, no sad faces back in Texas. His knowledge of opera proved as underwhelming as his fundraising skills. That didn’t stop the NYCO board from naming him not only general manager, but artistic director, last January. Two productions are staged by the same director, suggesting Steel’s tentacles don’t extend very far into the opera world. Muti, Anyone? Steel has hired an artistic administrator, Edward Yim, who comes from the orchestra world and represented conductors. Nobody goes to the opera to hear a conductor unless Riccardo Muti is in town. Is there anyone today at NYCO who actually knows how to run an opera company? The business plan the company was forced to submit before the attorney general’s office allowed it to dip again into the endowment makes you wonder. The 28-page petition basically promises to reduce the budget and number of performances while doing some cool marketing and promotions. The board even envisions repaying the endowment by attracting new donors! And just where might they come from? 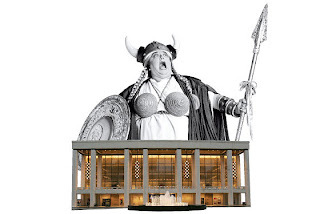 Even the far grander Metropolitan Opera is having fundraising problems. Artists, of course, are expected to tighten their belts. Meanwhile, the place doesn’t have a CFO. Is a bankruptcy filing imminent? No one wants to see a company of such historic importance disappear. But soldiering on with the very people who have wreaked disaster strikes me as delusional. ***NOTE: This article is an editorial/commentary issued by the aforementioned network and/or company. Any errors, typos, etc. are attributed to the original author. The article is reproduced solely for the dissemination of the enclosed information and may not necessarily be the opinion of A Liberal’s Libretto.